Detectives investigating the deaths of three teenagers at the Greenvale Hotel in Cookstown on St Patrick’s Day have arrested two men. Hotel owner Michael McElhatton, 52, was arrested on suspicion of manslaughter. It is understood the other suspect, 40, is a member of the venue’s door staff. He was also arrested on suspicion of manslaughter. Both suspects are in police custody. It comes after police today said it was fortunate that more people did not lose their lives in a crush outside the hotel following a crush on Sunday night. Students Lauren Bullock, 17, Connor Currie, 16, and Morgan Barnard, 17, all died from their injuries. Police have said youngsters will not face police action for being under age if they come forward, in a bid to encourage people to tell their stories. Officers have traced 160 witnesses and are conducting interviews, adding that they intend to speak to many more over the coming days. Mr Murray said there was an extended “crush situation” outside one of the doors to the hotel function room. Mr Murray said some parents expressed concern that their children, who may have been under age, were trying to enter a licensed premises. He said Northern Ireland’s Director of Public Prosecutions Stephen Herron had agreed that it would not be an issue in this investigation. 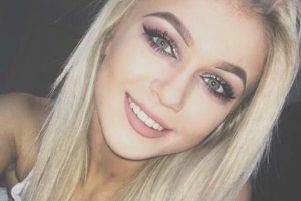 Eboney Johnston, 16, who was at the front of the queue to get into the hotel on Sunday evening, described the horrific events that led to three people losing their lives. She said that pushing was “normal enough” on a night out, but added: “It just kept going and going and people just started to fall, but as one person fell another went down. “As a person went to lift another person up they were pushing and shoving and another person would fall, which caused a build-up of everybody lying there. “We looked down and you could just see everybody lying there and then you could just see Connor himself being took out. Pupils at Holy Trinity College were joined by their counterparts at Cookstown High School and St Mary’s in Magherafelt for a memorial service for the three victims. Isabel Russell, principal of Holy Trinity College, urged pupils not to bottle up their concerns. “Talk to the staff, talk to your parents, and let them know what is on your mind. Keep yourself busy, get on with your normal routine as best as you can,” she added.